"This recipe has been a favorite in our family for three generations. Different from traditional carrot cakes, this cake is extremely moist and flavorful and is topped with a buttermilk glaze while still warm. Try it and I think you will agree that it is the best!! Be certain to reduce the baking temperature to 325 degrees F(165 degrees C) if using a glass baking pan." Preheat oven to 350 degrees F (175 degrees C). Grease a 9x13 inch pan. Sift together the flour, baking soda and cinnamon. Set aside. In a large bowl, combine the sugar and oil until blended. Beat in the eggs one at a time, then stir in the vanilla. Stir in the flour mixture just until incorporated. 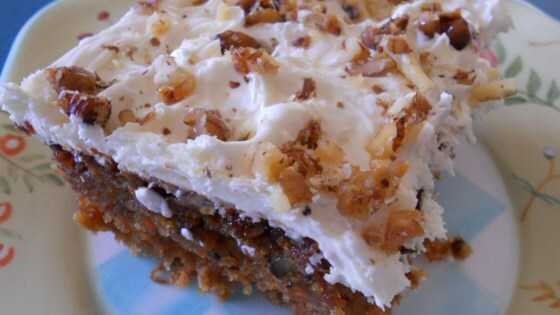 Fold in the pineapple, carrots, coconut and walnuts. Pour batter into prepared pan. Bake in the preheated oven for 45 minutes, or until a toothpick inserted into the center of the cake comes out clean. While still warm, poke holes in the cake with a fork. For the glaze: In a saucepan, combine butter, sugar, buttermilk and vanilla. Bring mixture to a boil over medium heat, then reduce heat and cook for 5 minutes. Pour glaze over warm cake, then allow to cool completely. This was good..the glaze is the biggest winner...but I still like another carrot cake recipie better. This is the best carrot cake that I have ever tasted. I made it with cream cheese frosting and it was absolutely delicious. My friends were also amazed at how nice it was.